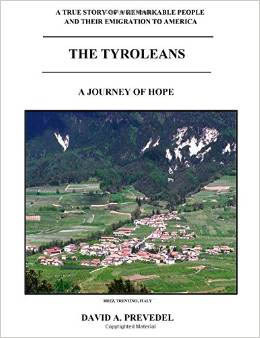 The Tyroleans: A Journey of Hope, A true story of a remarkable people and their emigration to America, (this is an Amazon affiliate link, click on title for information or to purchase), by David A. Prevedel, published in 2010. Available as a paperback through Amazon, price: $17.95. The minute you open this book, you know it’s a labor of love and a tribute to the author’s Tyrolean roots. David’s grandparents, (Giuseppe and Ester Rauzi, Floriano and Angelina Prevedel), all emigrated from the Val di Non in Austria (Italy). They, along with many other families from the villages of Brez, Castelfondo, Traversara, Fondo, Cloz and Tret, settled in Wyoming. At first they worked the coal mines in Superior and Rock Springs. 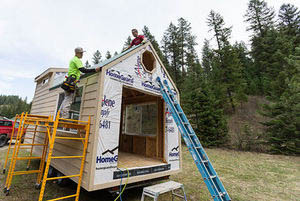 After saving enough money, many families moved to Utah, becoming farmers and opening businesses. The author draws inspiration from in-person interviews conducted over the years with his Tyrolean relatives, friends and their descendants. Mr. Prevedel weaves family stories together with historical details, to create a lively and sometimes, humorous portrayal of Tyrolean immigrants building a new life in America. He touches upon the origin and history of Tyrol, as well as the affect World War I had on the people of the Val di Non. Continuing to Wyoming and Utah, the author provides a glimpse into life during the 1920’s and 30’s, Prohibition, the Great Depression, becoming an American citizen, the role World War II played in the lives of Tyrolean immigrants, and the post war years. Not only did I find Mr. Prevedel’s book warmly human and heartfelt, but this small volume truly captures the reality our Tyrolean ancestors experienced in a new land. Sprinkled throughout “The Tyroleans“, I recognized many surnames from my own research and from our Genetti family tree: Corazza, Menghini, Anselmi, Rauzi, Segna, Cologna and yes, even Genetti. Matter-of-fact, I believe David Prevedal’s book has provided a new clue to another branch of our family I have yet to research. I thoroughly enjoyed this touching memorial to a Tyrolean family and highly recommend it to anyone with ancestral roots in the Val di Non. Stop by our online family Book Store to see all of our selections, click here! Shop for family mugs, t-shirts, mouse pads, glassware and family tree prints at our online Genetti Shop, click here! 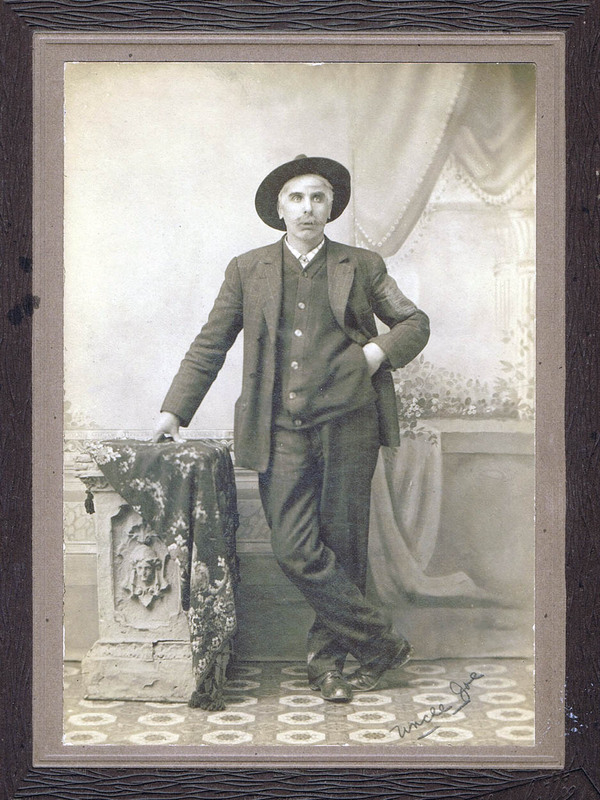 My great-grandfather, Damiano Genetti (1857-1944), had three brothers and three sisters who survived to adulthood. All of his siblings emigrated to the United States with the exception of his oldest brother, Sisinio Alessandro (1854-1908), who stayed in the village of Castelfondo. He passed away at the age of 53 of tuberculosis. 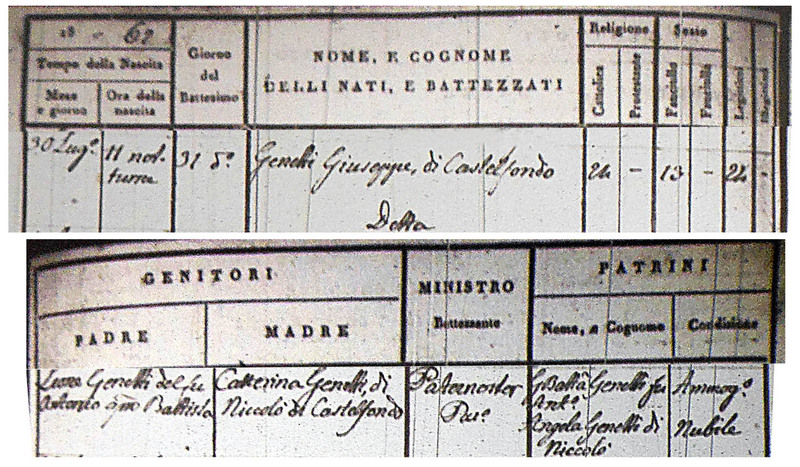 From the perspective of genealogy, we know quite a bit about Damiano and his siblings since they all left a trail of documentation: census, vital stats (birth, marriage, death records), land deeds, family photos, newspaper articles, etc. Every sibling except for one – Giuseppe Genetti (or Joseph in English). When I began our family research a number of years ago, I was told stories about Giuseppe. He had emigrated to Pennsylvania at a young age, worked in the coal mines, and one day left for California. His family never heard from him again. No one knew if he had any descendants, when he died or where he was buried. And there seemed to be no existing portraits of Giuseppe. Since I love a good mystery, my great granduncle, Joseph, became an ongoing research project that I have returned to time and time again throughout the years. Ship manifest from 1882 – Joseph Genetti is listed on the 2nd half of the document, 14th name from the bottom. I had two documents for Giuseppe that I felt certain of: his baptismal record from St. Nicolo church in Castelfondo stating that he was born July 30, 1862 and a ship’s manifest showing his arrival in New York City on June 19, 1882. The ship’s list showed that Joseph came over with two other young men of his village, Fortunato and Peter Ianas (both of whom I have identified in Castelfondo baptismal records.) And that’s as far as I got! He does not appear in any Federal Census, city directories, land deeds, marriage records or death notices under either Giuseppe or Joseph Genetti. As much as I searched, the only clue to Joseph’s whereabouts was a mention in the obituaries of his sisters, Marie Genetti Zambotti and Angela Genetti Recla. Both obits state surviving family members and siblings, including “Joseph Genetti of California”. Imagine my surprise when last month I received a photo from Don Lingousky identified as “Uncle Joe”. Don is the great-grandson of Angela Genetti Recla (sister of Joseph). After years of searching, here was an actual portrait of my mysterious great granduncle! What clues would it hold? Studio portrait of Giuseppe “Uncle Joe” Genetti – photographed sometime in the early 1900’s. After a little investigative work, Don and I determined that this must indeed be a portrait of the missing Giuseppe (Joseph), since we could find no evidence of a Joseph on the Recla side of Don’s family. Obviously a studio portrait, the image also contained the name of the photographer: L.C. Marchetti. This was another amazing clue! Searching online I found several formal portraits photographed in the early 1900’s by the same L.C. Marchetti who was from Nuremberg, Pennsylvania. At this time the Genetti siblings all lived in the same region of north central PA in the towns of Weston, Nuremberg, Hazleton and Sheppton, as did many Tyrolean families who immigrated from the Val di Non region of Austria (Italy). Since my grandmother was from the Marchetti family of Nuremberg, PA, I took a look at her family tree. There was my answer – she had an older brother named Lawrence Camillo Marchetti. He must have been L.C. Marchetti since no other Marchetti ancestors matched those initials. Lawrence would have known the other Tyrolean families and was probably the only photographer at this time in the area. Giuseppe may have had a formal portrait taken in Nuremberg before leaving on his travels. Judging from the dates on other portraits by L.C. Marchetti that I found, the time frame was most likely between 1900-1910. Since Don was in possession of the photo, it had apparently been handed down through Angela Genetti Recla’s family (Joseph’s sister). So from this evidence, we now know that Giuseppe (Joseph) was living in Pennsylvania at least until the turn of the century, that he had contact with his family before seeking his fortune elsewhere, and that he most likely lived with or close to them since the portrait was done in Nuremberg. 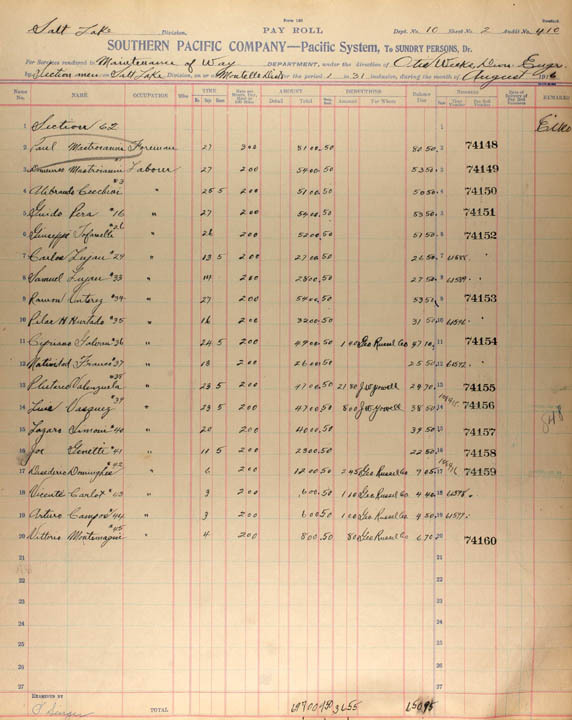 Payroll list from the Southern Pacific Company – Salt Lake Division, dated Aug. 1916. Joe Genetti is the 16th name on the list. I was so grateful to Don for providing this unexpected find! The information we had gleaned from the portrait now gave me some idea of a timeline for Joseph. Again I went back to searching hundreds of online records for any inkling of his whereabouts. Taking a different tactic, I researched categories and scanned through individual data bases, rather than doing a general search under records. After two weeks of research, I found one document with promise – although there is no hard evidence that this is our Joseph Genetti. What I came upon was a California payroll sheet from the Southern Pacific Company – Salt Lake Division dated August of 1916. It shows a Joe Genetti who worked as a laborer for eleven and a half days during this month, earning $2.00 a day, for a total paycheck of $23.50. Not much info to go on! I was aware of a Genetti family who had eventually settled in Utah, but they don’t show up in the Federal Census until much later in 1940. There was also a Genetti family living in California as early as the 1900 Census, but none that matched Joseph’s name, birth year or immigration year. Since the Southern Pacific was a railroad company, this could mean that he worked the rails and had no permanent address – if indeed, it is the same Giuseppe (Joseph) Genetti that we are looking for. With no other collaborating evidence, this may be hard to prove. For now, it is the end of the line for Giuseppe. As more data bases are digitized, we may come upon new clues in the future. Or, like Don’s portrait of “Uncle Joe”, information may unexpectedly surface from a family member’s closet or attic. If you are reading this blog post and have information, stories, letters or documents about Giuseppe (Joseph) Genetti born in 1862 in Castelfondo, Austria (Italy), we would love to hear from you! Our special thanks to Don Lingouski for your help and contribution to our family story. You can read the full obituaries of Angela Genetti Recla and Maria Genetti Zambotti (click on their names). And visit our Photograph Page to see our large collection of family portraits (including Giuseppe Genetti). Click here! About a week ago, I broke through a genealogy brick wall that had blocked my research for some time on a particular branch of my direct line. The results were a surprising discovery that shocked even me! Here’s the story. 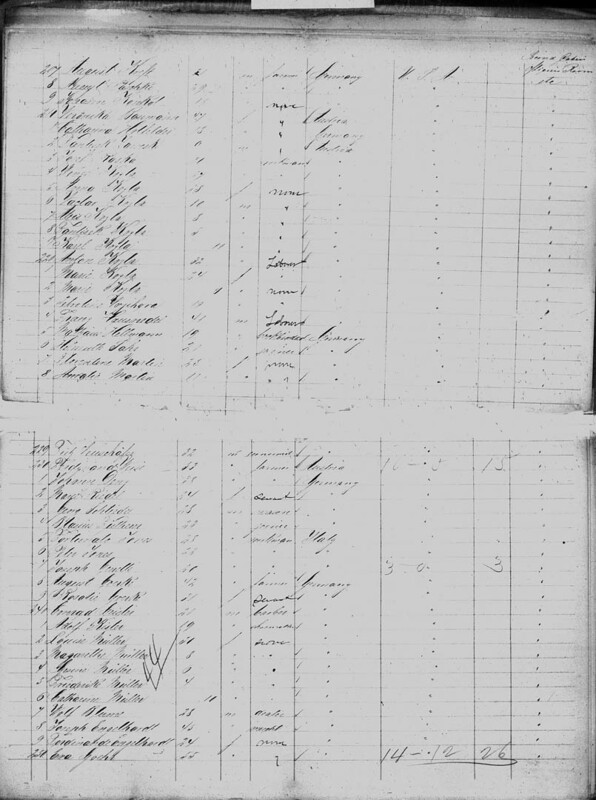 For the past few months I’ve spent a lot of time researching the Genetti family that settled in Illinois. This branch of the tree has many unusual stories with plot twists that have captured my interest. The descendants I’ve worked with are distant cousins that I’m related to twice since one set of their Genetti great-grandparents were fourth cousins. Usually I’ve found our kindred relationship to be eighth cousins through Cipriano Genetti (1811-1890) and fifth cousins, once or twice removed through his wife Catterina Genetti (1812-1875). When you look at our family tree pictured above, their family is located on the far left bottom corner and my family occupies the far right branches located half way up from the bottom right corner. As I sat at my desk last week, researching ancestors and checking against the tree hanging on the wall before me, something caught my eye and clicked in my brain. To understand my discovery, we need to switch gears and talk about my great-grandmother, Oliva Zambotti. She married Damiano Genetti in 1886. I had worked on the Zambotti genealogy stretching back to the early 1700’s, but always hit a wall when it came to Oliva’s grandmother, Barbara Genetti (my 3rd great-grandmother) who married Alessandro Zambotti. Yes her maiden name was also Genetti! Up until this point, I had found no information on Barbara’s parents, Giovanni Battista Genetti (1767-1811) and Maria Domenica Corazza (1776-1854). Nor was I able to go back any further in this ancestral line. I assumed they were from the Genetti family with roots in the villages of Fondo or Dambel – a distant relation to the Castelfondo Genettis, with our common ancestor existing sometime before the mid-1500s. As I studied the family tree that afternoon, I realized I had been looking for Barbara’s parents in the wrong place. There before me I saw their names. Giovanni Battista Genetti and Maria Dominica Corazza (my 4th great-grandparents) were ancestors of the Illinois Genetti family and on their branch of the tree! I had been researching Giovanni and Maria all along for their descendants and never made the connection. That means my 4th great-grandparents through my Zambotti great-grandmother were also the 4th great-grandparents for many of the Illinois Genetti descendants – they were the same people! My great-grandmother, Oliva, was first cousins, once removed with their Illinois patriarch in America, Vigilio Genetti. Oliva’s grandmother, Barbara Genetti Zambotti, was Vigilio’s aunt! This changed everything! I was shocked at first, as I never considered that my Zambotti line had a Genetti ancestor from the 1700’s (although there have been four Genetti-Zambotti marriages in my family since 1886, including my great-grandparents). Since Barbara Genetti’s parents (with their very long genealogy) were already part of my online family tree, I simple plugged in my great-grandmother Oliva’s connection and she instantly had Genetti ancestors going back to the 1400’s – sharing five ancestors from 1650 to 1491 with her husband Damiano. This means that my great-grandparents are 5th cousins, once removed – and Oliva is actually 6th cousins with her own children! Getting back to the Illinois clan, I am related to Vigilio’s descendants through both of my great-grandparents – and through four common ancestors – Pietro Genetti 1650-1706, Giovanni Battista Genetti 1746-1807, Giovanni Battista Genetti 1767-1854 and Domenica Corazza 1776-1854. For many of Vigilio’s descendants, I am their 5th cousin (3 times!) as well as their 8th cousin. I wonder what our DNA results would look like? What kind of match could be determined by having so many common relatives? If anyone from the Illinois Genetti family would like to have their DNA tested through Ancestry.com (where my DNA results are based), let me know. I’m sure it would be absolutely fascinated to see the results! 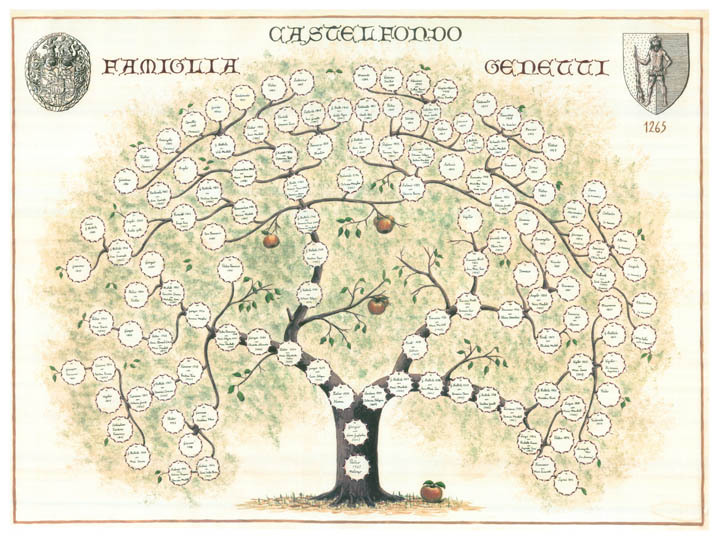 If you are interested in purchasing a fine art print of the Genetti Family Tree, stop by our Shop for details on how to order your own piece of our ancestry. Click here! Erminia and Emmanuel Recla with their family. 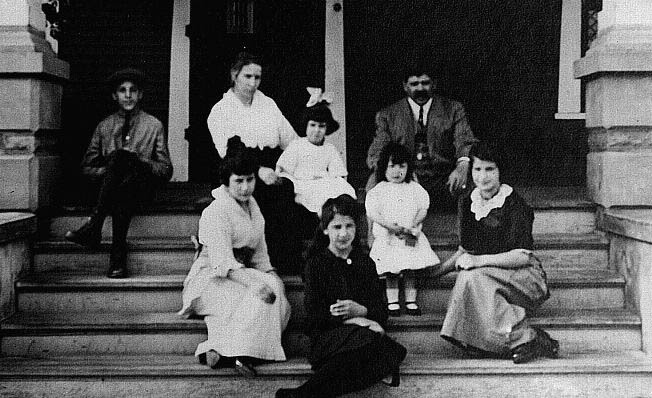 Children are Ralph, Elaine (in lap), Catherine (standing), Esther, Marie and Emma. Thank you to Mary Russell for sending me two family photos. Mary is the great-granddaughter of Erminia Enrica Genetti Recla. The youngest child of Leone and Cattarina Genetti, Erminia was born in Castelfondo, Austria (Italy) in the year 1876. 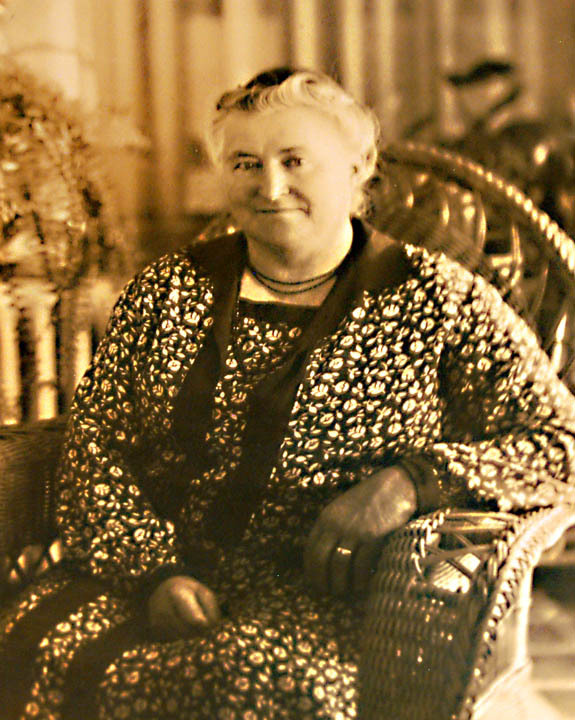 She arrived in America in 1890 at the age of 13. The ship’s passenger list shows that she traveled with her big brother Damiano, who escorted her across the ocean and then returned to his family in Castelfondo. 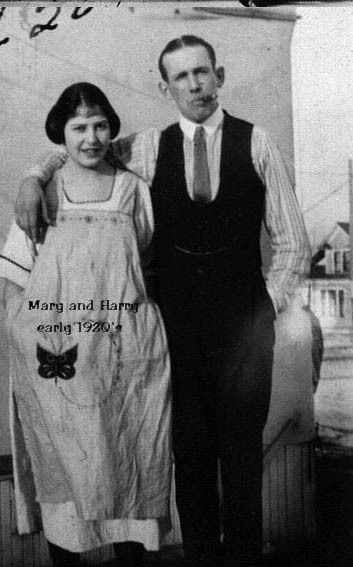 Marie Recla and her husband Harry Pettis – early 1920’s. Since most of Erminia’s large family was already living in Pennsylvania, she was not alone. Her older sister Angela, had married a young man by the name of Raphael Recla in 1887. Angela must have introduced her little sister to Raphael’s brother, because a few years later in 1893 Erminia married Emmanuel Recla. The couple set-up housekeeping in Shepton, PA near Angela and Raphael, where their first two children were born. By 1897 they were living in Michigan and five more children followed. The family moved again around 1907 to Spokane, Washington and four more children were added to the large family. Of Erminia and Emmanuel’s eleven children, eight survived to adulthood. Erminia passed away in 1972 at the ripe old age of 95. She was laid to rest next to Emmanuel (who passed away in 1939) in Holy Cross Cemetery – Spokane, WA. Erminia was the last surviving sibling of her family. The interesting part of this story is that I met Mary Russell, Erminia’s great-granddaughter, through Ancestry.com when our DNA results came up as a match. Mary’s test results matched mine as “extremely high probability for 3rd or 4th cousins”. And sure enough, our “shared ancestor hint” correctly predicted that we shared common 2nd great-grandparents, Leone and Cattarina Genetti. Our great-grandparents, Erminia and Damiano, were siblings. This made Mary and I third cousins. I’m so glad that science brought us together and I have yet another lovely person to call cousin! And one more twist to the story – I recently worked on an ancestral genealogy for Don Lingousky, the great-grandson of Angela Genetti Recla (see blog post from March 26, 2015). Don had emailed me directly, providing information and photos for our family tree. Since Don and Mary shared both a Genetti and a Recla ancestor (two Genetti sisters marrying two Recla brothers) and they were both interested in their family’s genealogy, it was only natural that they should meet. After several emails between the three of us, Don and Mary are now working on their Recla ancestry together. As it turns out – Don, Mary and I are all third cousins through the Genetti family. Don and Mary are also third cousins through the Recla family – therefore they are twice related. I bet they share a very interesting DNA match! Make sure to visit our ever-growing Photograph page in the Gallery section of The Genetti Family Genealogy Project. 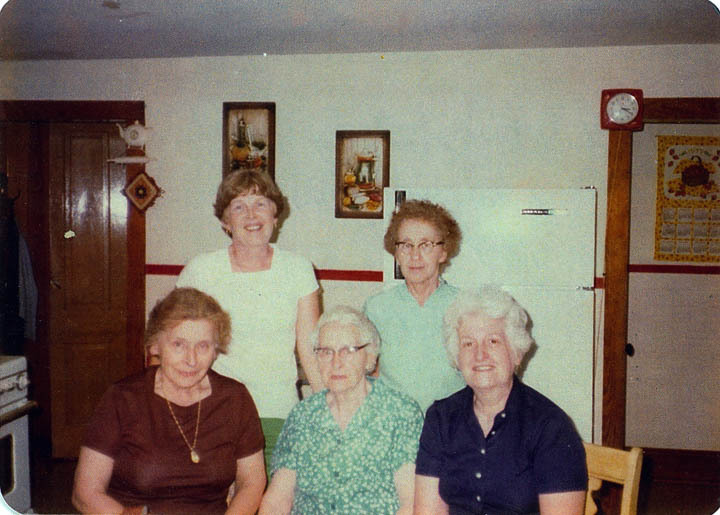 You might also enjoy reading about the Genetti clan on our Family Stories page.